Transforming into a werewolf can seem like a burden. We get that it's rather isolating and can be a little dangerous. You never know where you're going to wake up or if you've destroyed the neighbor's chicken coop. But it's time that we highlight the positive side of the beast. Cause this is actually a great way to roam free. Gallivant through the woods and have a wild adventure. Sprint through streams, slink through meadows and howl on top of mountain tops. And with all that exercise your inner-beastie is enforcing, you get to eat anything you want. After you stop coughing up chicken feathers, that is. These latex ears are sure to level up your look in an instant! The ears are molded to make it look like you could hear a laughing couple creep along a misty lane from miles away. 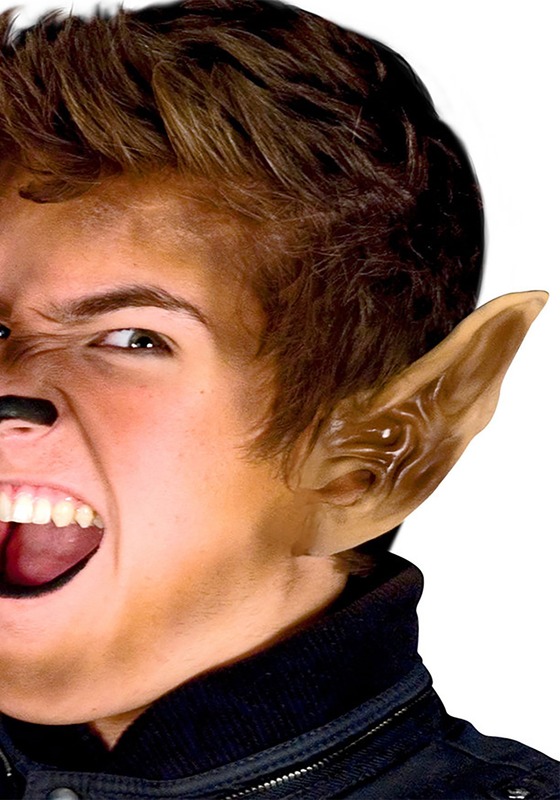 Apply these ears with spirit gum from our special effects catalog and you'll notice your hackles start to rise. Are you ready to get wild? Don't forget all the little details that make you into a monster. From hairy, clawed gloves to sharp and dangerous looking teeth, your look is sure to be edgy. Folks had better watch out at the next full moon!